Wondering why your homemade chocolates look cloudy and dull when they set? Conquer the art of tempering chocolate, and get ready for the exquisite results! If you&apos;re anything of a chocoholic (guilty! ), then you&apos;ve surely tried making your own chocolates at home. But if your choccie creations have turned out grey or cloudy once set, it&apos;s most likely because you didn&apos;t temper your chocolate. Tempering involves heating and then cooling chocolate in such a way that a crystal begins to form within the cocoa butter. Correctly tempering your chocolate will result in a shiny and more even looking chocolate, and will give you that crisp, easy-to-break-off consistency you get with store-bought bars. Tempered chocolate also shrinks as it sets, meaning that chocolates set in moulds are easy to remove. Place a heatproof bowl over a saucepan of gently simmering water. Don&apos;t let the bowl touch the water. 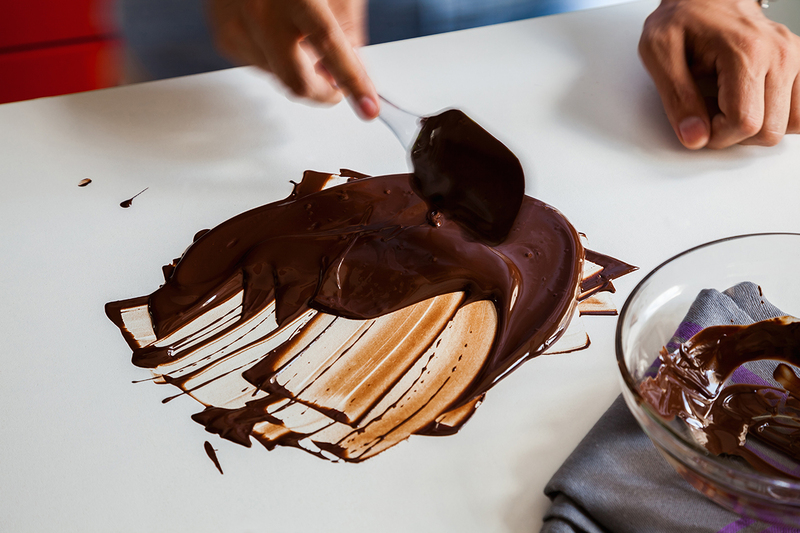 Break up three-quarters of your chocolate into small pieces and add to the heatproof bowl. Melt chocolate, stirring, until smooth and digital thermometer reads 45°C for milk and dark chocolate, or 43°C for white chocolate. Remove bowl from saucepan and place onto a heatproof surface. Add the remaining chocolate to the bowl, chopped into small pieces. 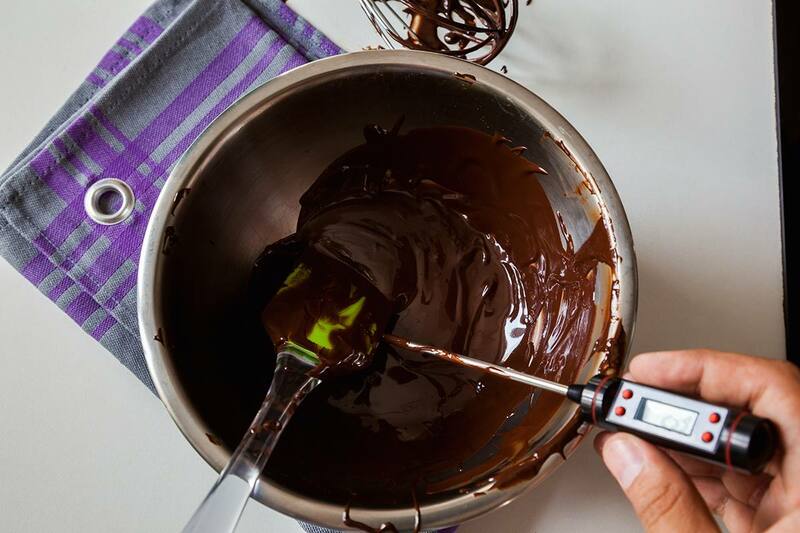 Stir continuously with a spatula until all the pieces have melted and thermometer reads 28°C for milk and white chocolate, or 30°C for dark chocolate. Be patient, this process may take longer than expected. 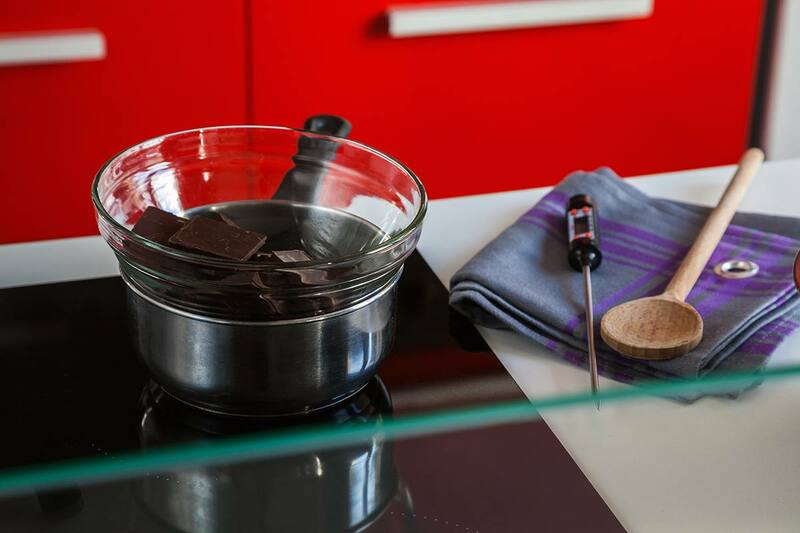 Optional step: to quickly reduce the temperature of the chocolate, pour two-thirds of melted chocolate onto a smooth stone surface. Using a palette knife or spatula, spread out the melted chocolate evenly, and then using a scraper, push it into a heap in the middle. Mix mixture in the middle, spread chocolate once more, and repeat the process. Continue to repeat this step until chocolate becomes the consistency of cooked custard. Once it is at this point, return chocolate to the bowl and heat until at 28°C. Use tempered chocolate as soon after as you can, before it begins to cool and thicken. If it begins to cool, heat again over simmering water for a few seconds and stir. When taking thermometer reading, make sure the thermometer is not touching the bowl so that you&apos;re testing the temperature of the chocolate, and not the bowl.